I am now about to use platinuma word that I take very seriously: BRILLIANT! That word describes a new attempt at a revision of the original Elite quite well. The graphics are exactly the way they should be for a game that brings back the nostalgia of the original Elite, though they are updated for the latest video technology. Not only that, but Christian Meyer gives us the added realism of star systems with multiple planets! Some systems have up to 7 planets with many of them having space stations orbiting them! This game was originally being produced by a team of two brilliant programmers, Jens Barleau and Christian Meyer. Unfortunately, Jens had to leave the project as many real world things kept him from working on the game. As he was also the webmaster for the project, Elite Platinum was about to be without a home. I couldn't let this happen and am more than willing to give Christian the space to upload the game and its revisions. Click Here to Download Demo Version 1.5 with Diagnostics Feature! If you have any comments, questions, or suggestions, please send E-Mail to Christian Meyer. Many Elite fans who are also computer programmers have been working on making their own sequels, patches, and revisions to this game. They have asked us, the fans, to be playtesters and to give our suggestions on what would improve them. The number of these projects out there is staggering, making Elite fandom at nearly the same level of diversity as that of Star Trek! These same people are also a bit afraid of what may happen when their work is done and the programs ready to be released. I only hope that Mr. Bell and Mr. Braben realize that the people working on these ideas are doing it not to show the original creators up or stiff them out of cash, but because they love the game and want to pay their own special tributes to it. If I had a better knack at programming, I think I'd be doing the same thing. As I'm a professional musician and I spend upwards of 8 hours a day playing my axe, all I can do is offer my suggestions to these programmers. This small group of game designers are putting together an original Elite-type game called Millennium 3: Future's end. The concept is similar, but everything else, including the flight engine, is different. The ship designs are pretty cool too and the graphics are quite impressive (though they sure to put my P233 to the test! Sadly, this game has stopped being worked on for now. Hopefully, the programmer will come back and finish it up soon, but until then, all we can do is wait patiently. Christian Pinder (Another Elite remake programmer named Christian? What are the odds?) has finally completed a reverse-engineering of the source code to the original BBC Elite! In addition to completing this difficult task, he has souped up the graphics so we have actual colored shapes and not just line art that you can see the stars through. 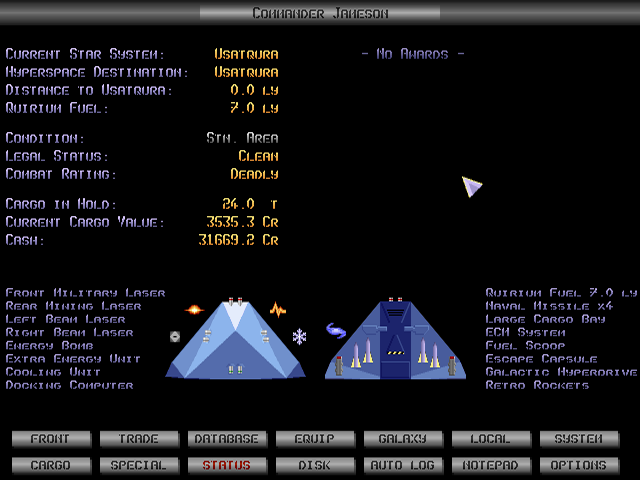 Anyone who wants to get into the nostalgia of playing the original Elite on a modern PC can now only dream about what it was like since David Braben decided to make the ridiculous demand that the game NOT be available for download anymore.